ATree3D is simple to use 3D plants generator for architectural visualizations. 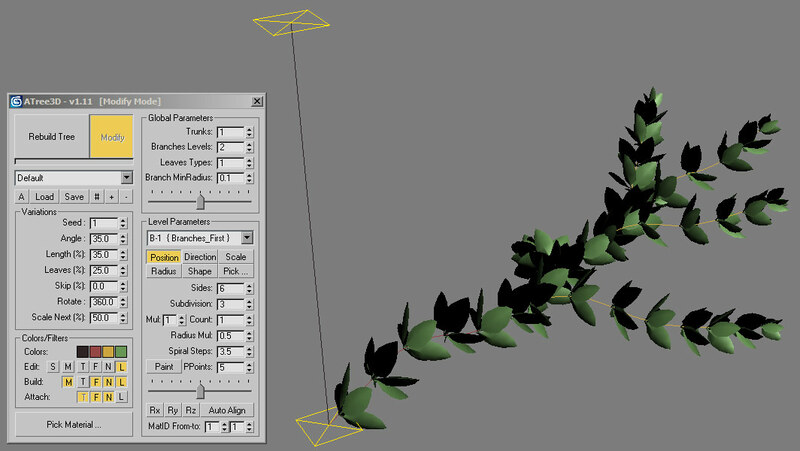 With this script for 3ds max you can create trees, bushes, flowers and grass. You can use it for low or high polygon models with precise control of the level of details on each sub-element. Script works inside of the 3ds max viewport and show instant preview of your changes. If you like this script please share your plants and trees(.at3d files) with the community. 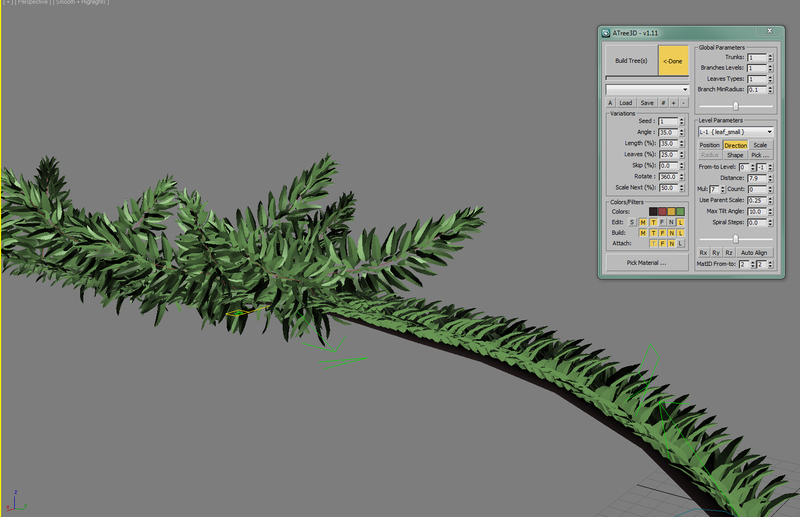 Thanks to YANN now its easy for everyone to share and download trees and plants for the ATree3D script. Visit 3dtreexchange.net - ATree3D Resources for CG Artists! A lot of new options, optimization and UI improvements. Option to set volume for the tree branches. Fix open and save trees (*.at3d files) in 3ds Max 2013. Fix pick new mesh function for leaves. Now the start point of the new leaves is at the same position as the pivot of the original object. New macro script to modify selected ATree3D object with keyboard shortcut or toolbar button. When painting new trunks or branches, the name of the selected level does not change. Change the orientation of branches and leaves relative to parent or world. Multiply branches and leaves count. All leaves and branches now can be generated in spiral shape. Leaves support more than one UVW map channels. Paint with mouse the shape of trunks and branches. Now you can modify already created models. New download page with more information about the script. To add a keyboard shortcut or toolbar button go to 3ds Max menu, select: Customize > Customize User Interface... > in "Keyboard" or "Toolbar" tab select Group: Main UI and Category: AvizStudioTools. Assign keyboard shortcut to "AvizStudioTools - ATree3D" from "Keyboard" tab or from "Toolbar" tab drag and drop "AvizStudioTools - ATree3D" to a new or existing toolbar to create UI button for the script (for Windows 7 or Vista you may need to run 3ds max as administrator). Submitted by atanasbak on Mon, 2019-02-11 22:56. You can use meshes with or without alpha image. All the leaves in the included examples are only meshes without maps for the alpha channel. Submitted by aksmfakt132 on Mon, 2019-02-11 17:25. Is the leaf an alpha image? Submitted by Nevil on Thu, 2013-04-25 20:09. Submitted by Script_Butler on Wed, 2013-04-24 04:33. A great script I'm just dipping in to. Submitted by atanasbak on Mon, 2013-01-14 23:34. Every now and then I get similar to the first error that you describe usually on a 32-bit system with big tree. I believe it is memory related. If you can send me your tree I'll check it for errors. - Go to Customize -> Preferences... -> Max Script -> Memory - set it to 50MB or more. - When possible work in "Speed edit" mode ([s] button in edit filters). I'll check the undo system, script should not clear the undo levels but it happens. The last problem - I don't know what causing it but the only solution is to restart max. Submitted by arieas on Mon, 2013-01-14 17:45. I really like the script, not used it too much, but messed around with it, and will be definitely be using it to make trees for game usage, which this is perfect for with its options, actually looking forward to building up a tree database much faster than my previous attempts. I have only held off using it much so far, as I am having a number of issues which make it unusable or tedious to use for anything intensive. Using max 2010, 64bit. After some editing, closing edit mode, and building, going back to editing, I encounter the Maxscript garbage collection error, only indicating an error occurred while max was performing garbage collection. With that, an error box with a code like x112.02.0059 (not sure if it is different on each occasion), and the options to 'try to recover and restart script' and 'close script'. Close script works, and I can edit again, but it'll pop-up again when editing. Sometimes, it causes 3dsmax to freeze, in turn making the whole system lock up for a minute. Not sure if its my copy of max, some settings conflicting. I am very much interested in using the script a lot in future, as its pretty much what I have needed, easy tree creation, but directly in max. Submitted by 3D_Animator on Thu, 2012-11-29 04:28. Simple, and with great options. Submitted by atanasbak on Wed, 2012-08-01 03:20. The orientation of the truck is always align with the world XYZ axis. This is the reason way orientation of the leaves looks wrong in your example. For plants like this I suggest to uncheck Built [T] filter, set simple straight line for the trunk and make the shape of the first level branches like your current trunk. Submitted by Philip999 on Tue, 2012-07-31 13:51. This script is awesome! However, I have a bit of an issue. Leafs that I assign to the trunk, don't take on the orientation of the trunk like they can do with the branches. Not sure if I'm doing something wrong here but its working on my branches. (see attached) I would like them to go evenly around the trunk, like they are on my branches. I should perhaps also mention that they do go evenly around if the trunk is upright, but as I want it to go parallel to the ground it not working.